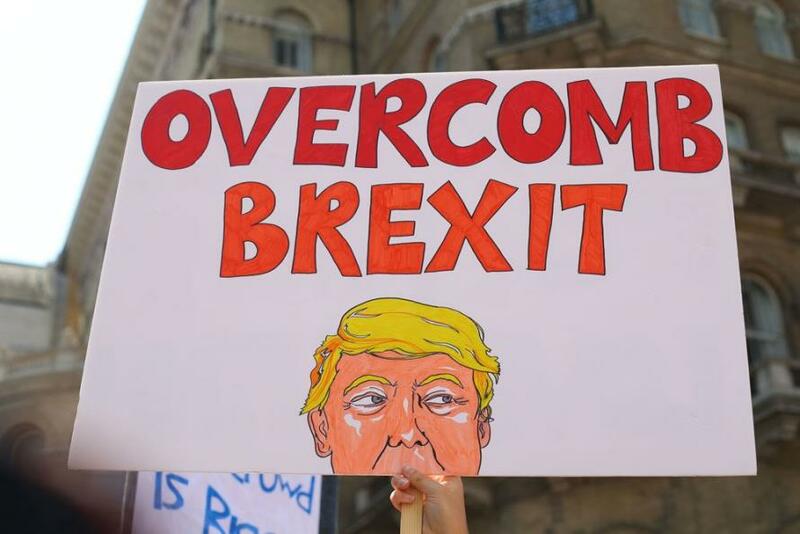 Thousands of demonstrators from several organized groups are marching through central London to protest President Trump's visit to the UK - chanting "Donald Trump's not welcome here" holding up posters with all sorts of interesting things on them. 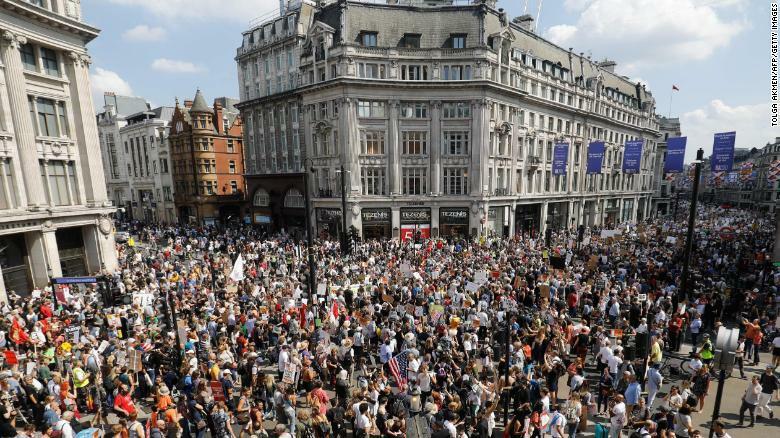 Descending on London's iconic Trafalgar Square, organizers claim about 100,000 people showed up for the protests - though at last report there were 50,000 people signed up - which would be the largest weekday protest in London since the 2003 demonstrations against the Iraq war. London's Metropolitan Police have not confirmed the size of the crowd. "It's nice to see so many people gathered for one cause," protester Rania Belarbi told CBS News. "We're all gathered for love, for equality, for togetherness, so that's a great message that we're sending out to the world." Perhaps the most anticipated participant was a $23,000 20-foot crowdsourced "Trump baby" balloon depicting Trump as an angry diapered baby clutching a cell phone with Twitter open on the screen. Except, 20 feet isn't that big when you actually get it in the air. For reference, Macy's Thanksgiving day parade balloons are around 60 feet long and 30 feet wide. LOL. Now this is funny. Remember the Hindenburg sized blimp of Trump over London that was going to rock his world? That said, the Trump balloon was apparently downsized from its original incarnation. "We took some of the hot air out of bigger Donald, some of the narcissism, some of the fascism, and a little bit of the xenophobia," said Barny Francis, one of the people holding the smaller balloon. "We put it into this smaller version of him, Francis continued. "So he's still full of hot gas, it's just a little version of him now. This is mini-Donald," he said, adding that the larger balloon was on a "secret mission." 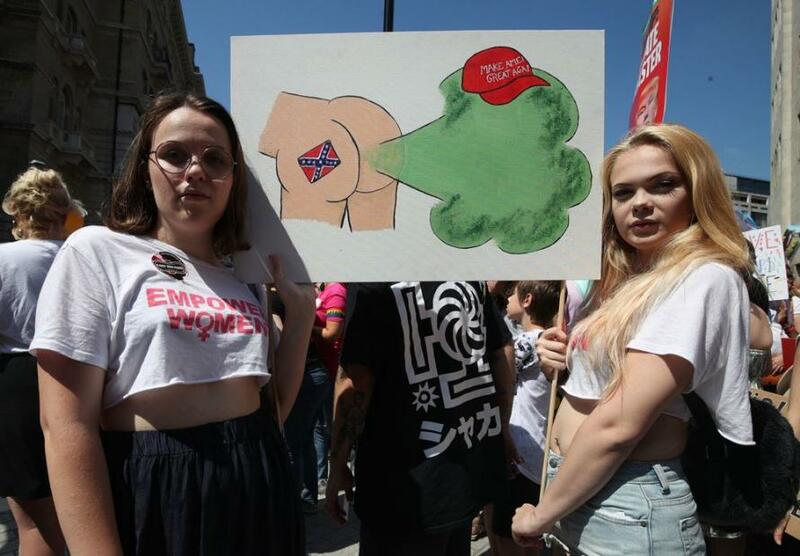 Tensions have flared as a small group of pro-Donald Trump demonstrators exchanged chants with anti-Trump protesters near London's Trafalgar Square. "We love Trump!" about 10 demonstrators chanted as police officers standing shoulder to shoulder kept the two opposing groups apart. Meanwhile, several conservative groups are holding their own separate rallies to welcome Trump to their country. On Saturday, a “Welcome Trump” rally will take Trump fans from outside the new American Embassy in the southwest of the city all the way to Downing Street. British police have imposed tight restrictions on this demonstration, as well as a simultaneous march in support of right-wing activist Robinson, who is currently serving a 13-month jail term for contempt of court related to his breaking of reporting restrictions. I’ve never had time to protest.